Blues don't get much prettier than in Hanauma Bay on the southeast corner of O'ahu. 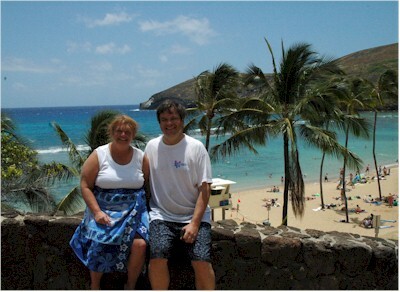 Susan and I returned here for the first time in 21 years for a little snorkeling. Here we are on the walk back up the hill, still a bit damp, with memories of coral and tropical colors flooding through our minds.